I'm quite new to java. This set of code results in making an empty frame without any component displayed. However, when I tried putting pack method after I added game component to the JFrame, it successfully displayed what I intended to display. 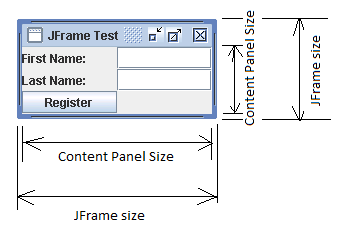 I heard that pack() method is used to pack the components within the JFrame based on the component’s preferred sizes. However, I don't understand how the position of pack() method could influence the entire rendering (only displaying an empty frame). The rectangle box at the bottom are cut off instead of fully displaying 5 * 5 rectangles (each rectangles has dimension of 64, 64 and the frame size is supposedly 320, 320). I assumed that it's because I'm using mac. I think this can also be fixed using pack() method but I don't know how. You must be careful with setting the size... if you set the size from the JFrame you override the ability of pack(). Not the answer you're looking for? Browse other questions tagged java rendering graphics jframe or ask your own question. What measurement units are used in the return value of the getWidth method in the UnicodeFont class supplied by Slick2D?